This week, Uber started picking up passengers with self-driving test cars in Pittsburgh – so it’s not surprising that just a few days later, Lyft has something to say on the subject. Lyft’s response may not be autonomous cars in active duty, but it is a lengthy, detailed treatise on how Lyft sees the future of transportation over the next ten years, as penned by Lyft co-founder and President John Zimmer. The Medium post from the Lyft exec articulates a vision of the future that would see most of the rides on Lyft’s network of cars handled autonomously by 2021. By 2025, Zimmer anticipates that personal car ownership, specifically in U.S. urban areas, will essentially be a thing of the past as denizens opt to use shared vehicle networks. 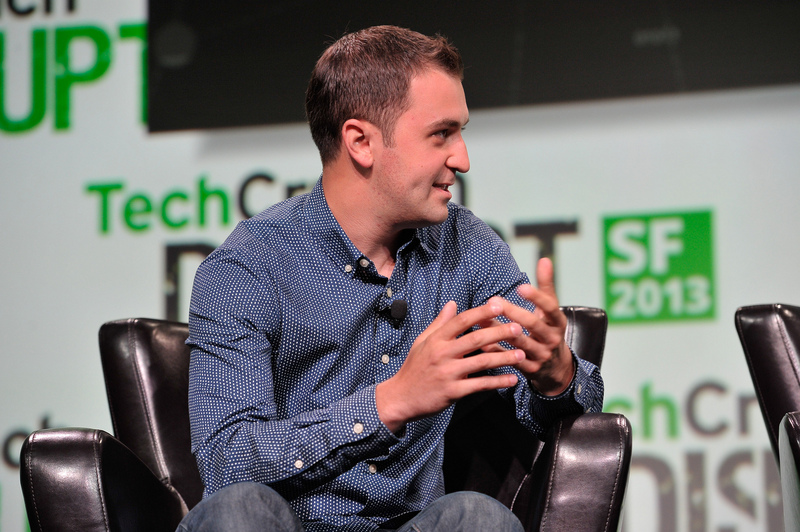 Lyft co-founder John Zimmer at TechCrunch Disrupt SF 2013. Zimmer’s post is a little reminiscent of the breathless portraits of the future adorning pages of Popular Science in the 50s and 60s, but it also stems from a desire to fix genuine problems. He told me reinventing urban spaces has actually been one of his goals from the very beginning, as he got the idea for Zimride (which actually predates and launched Lyft, but which was sold by the company to Enterprise in 2013) because of an urban planning class he took in college. 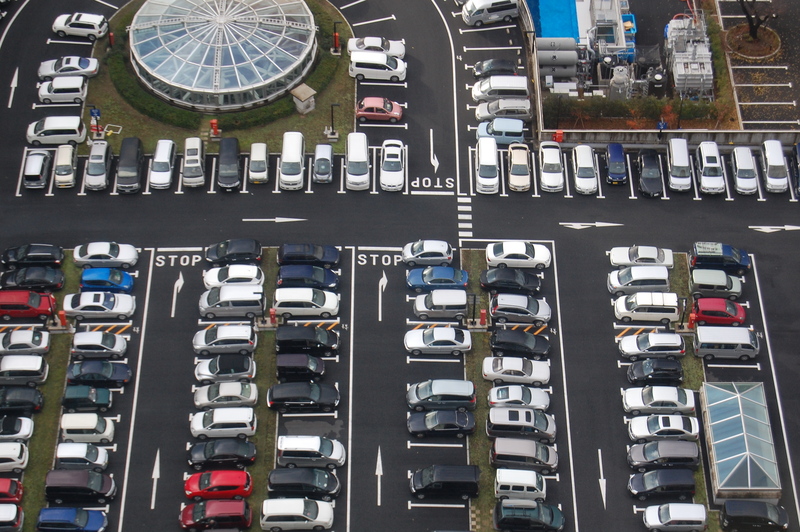 Parking lots like this one in Tokyo currently take up vast tracts of otherwise useless urban space. While he’s excited about the potential possible to address those issues when you transition to a world where vehicle ownership is not the dominant mode, and self-driving is the norm, Zimmer also isn’t under any illusions about the challenges potentially preventing his vision from becoming a reality. He says it’s “not certain” at all that we can make this happen. “It’s not going to happen if we’re just doing stunts, and just talking about what the inside of an autonomous vehicle looks like,” he noted, while also adding that the design of the in-car experience is definitely still an important piece of the puzzle. Car design is part of the competitive advantage of a model like Lyft’s, he claims, and one that will work in concert with a future mileage-based subscription model Lyft sees as viable in a hybrid autonomous fleet-based offering. That’s part of why autonomous car deployment will work best via managed fleet networks like the one to be operated by Lyft, according to Zimmer, when compared to the model Elon Musk has articulated for an eventual future in which a network of individual owned Teslas can be rented out on-demand as needed, driving revenue for the vehicle owner themselves. Essentially, Zimmer’s critique of Musk’s model comes down to consistency and quality of experience, cleanliness and maintenance, all of which are easier to guarantee when a fleet is centrally managed. 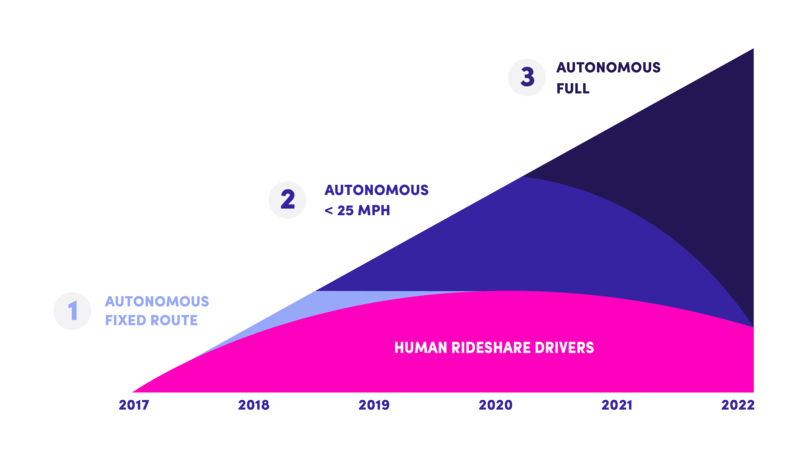 How Lyft sees human driver demand increasing with near-term autonomous advancements. Credit: Lyft. But what about jobs? Critique of autonomous fleet transportation networks typically includes concern for the human drivers currently employed by Lyft and others. Zimmer somewhat counter-intuitively argues that in the near-term, the demand for human drivers for Lyft will grow rather than decrease ahead of the transition to autonomous vehicles. He says the realities of urban transit will swell demand for shared services like Lyft, increasing the need for drivers while tech catches up to the point where vehicles can operate without anyone behind the wheel. Lyft is also hoping to be flexible in terms of partners in its own role within the overarching system, operating at the network level, on par with operators like AT&T or Sprint in the overall wireless market today. Zimmer stressed that this was the company’s focus in response to a question about whether the company didn’t require more control over the hardware side of the equation to deliver on its ultimate vision. Zimmer’s vision is definitely compelling, but the key ingredients will need to start coming together quickly to back up his roadmap. As he noted in our interview, Lyft is already testing vehicles with autonomous tech with GM, so that part at least has begun in earnest. As for the rest, we’ll have to watch where the road takes us.